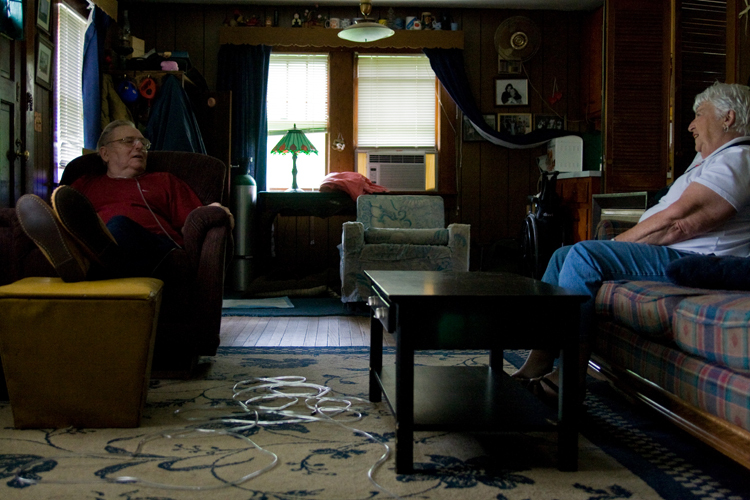 Twice widowed with two sons, 78-year-old Fleurette has visited Bob once a week since August 2008. 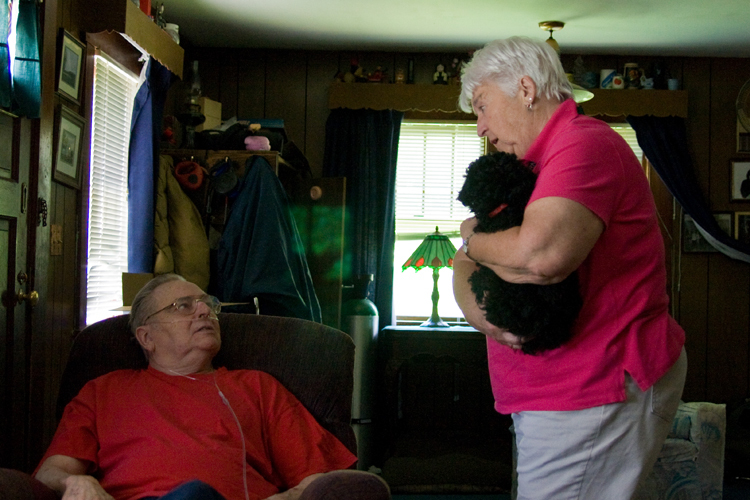 Not a typical hospice case, Bob is a patient in the “Living Well” program at Hospice of Southern Maine. 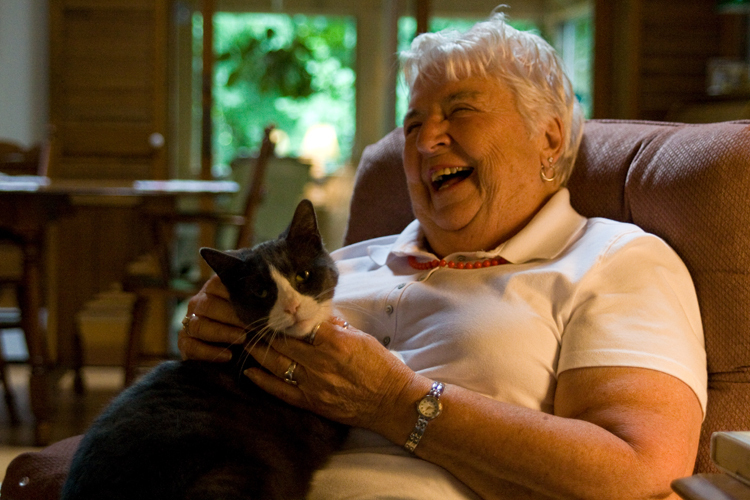 The pre-hospice program for individuals with a life-limiting illness whose life expectancy is one year or less provides assistance in managing home life as the disease progresses. 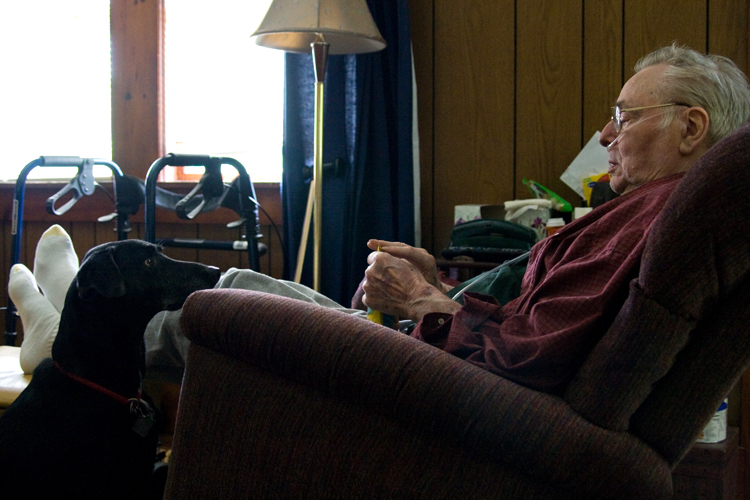 Fleurette and Bob’s sensitive dog Susie have also become friends over the months. 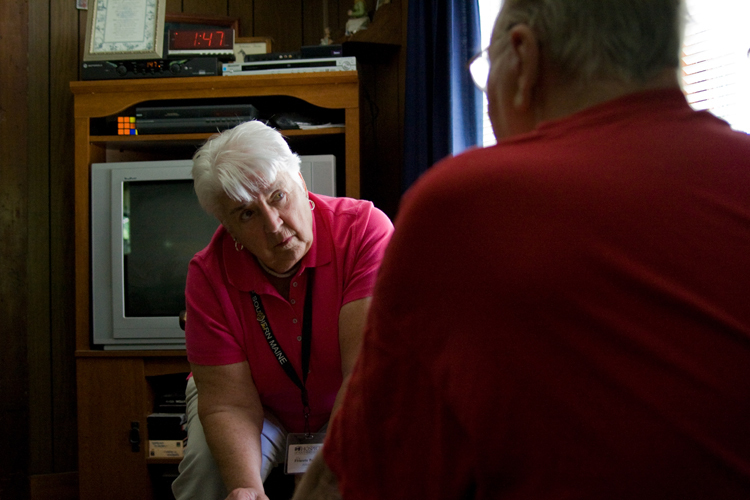 For Fleurette, her training and experience as a hospice volunteer have changed her own feelings about death. 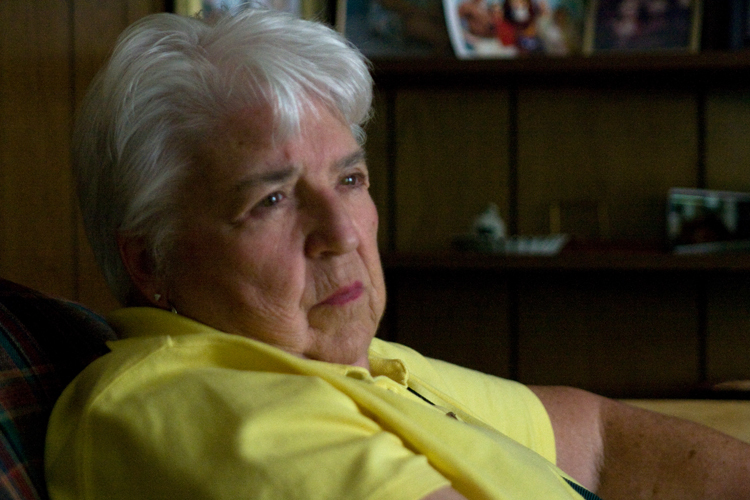 She says the fear and dread are gone, and she is comfortable with death as just a part of life. 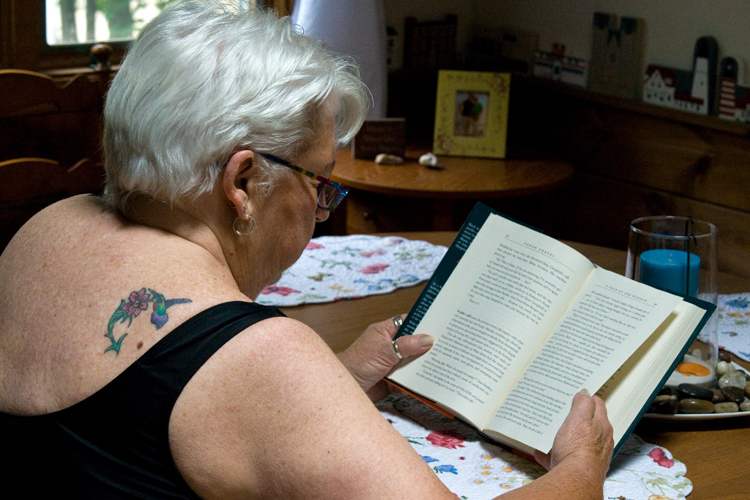 On her 75th birthday, Fleurette got her first – and so far only – tattoo. Just 37 years old when her first husband died, Fleurette recalls that although they knew for a year he was going to die they never talked about it or prepared for it together or said goodbye. 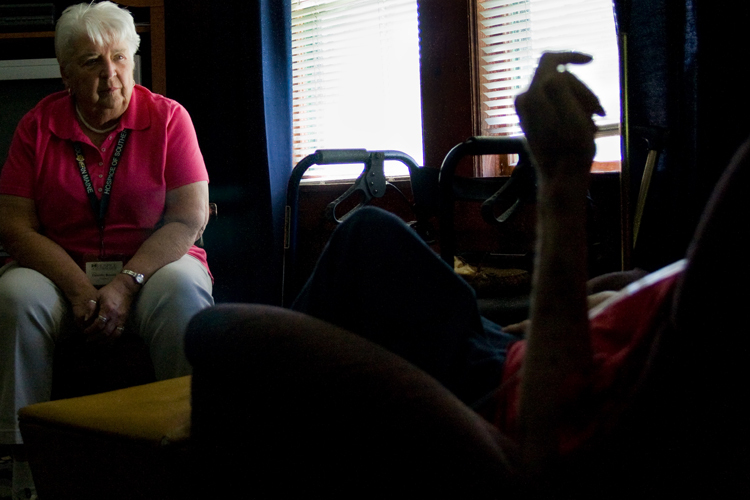 When her second husband died in 2000, she says that talking about it, planning for his death together, and saying goodbye left her with no regrets. Fleurette describes her own feelings toward death now as acceptance. In American culture where we use “passed away” or other euphemisms to avoid even speaking the word, Fleurette talks about death and dying very openly and directly. At Senior College, Fleurette teaches a memoir writing class. She is also working on her own memoir. 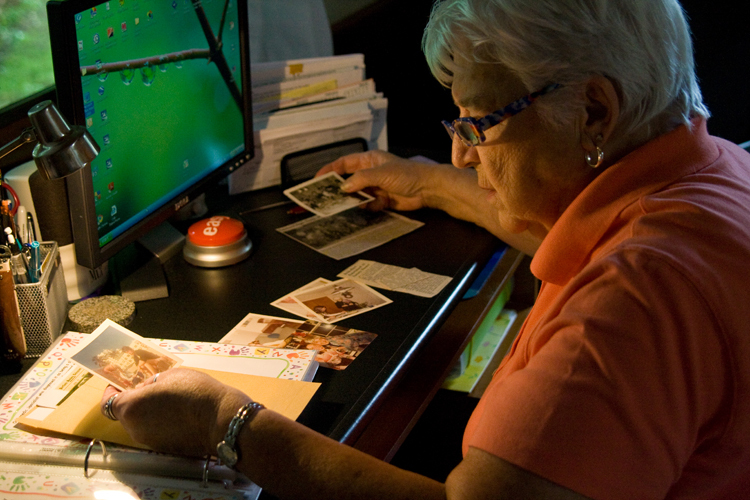 Looking at old photographs is an excellent way to trigger memories and get the writing to flow, according to Fleurette. 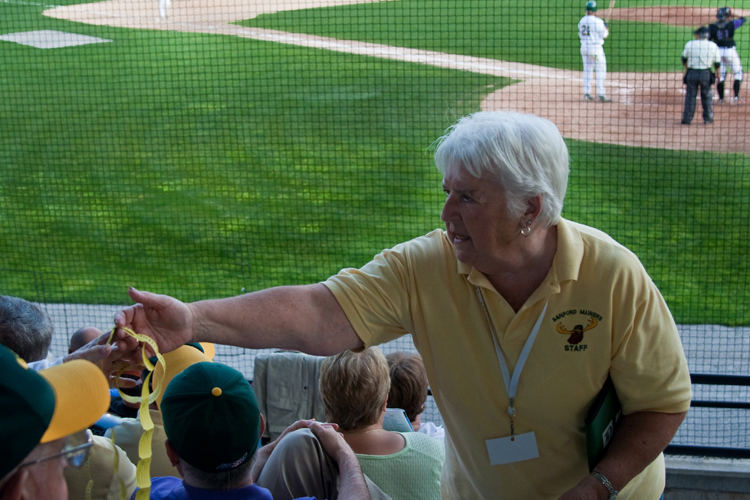 During the summer months, Fleurette volunteers at every home game for the Sanford Mainers baseball team. In addition to the game itself, she also enjoys being part of a popular community-wide event. “Everyone’s here,” she says with a smile. Fleurette says there was something about hospice that felt comfortable for her from the start, explaining that she never felt nervous even on her first volunteer visit. Fleurette does not have a particular goal in mind for each visit. She assesses the needs of the patient and family members on the fly when she arrives and is willing to do whatever she can to help out, such as taking the dog for a walk outside. 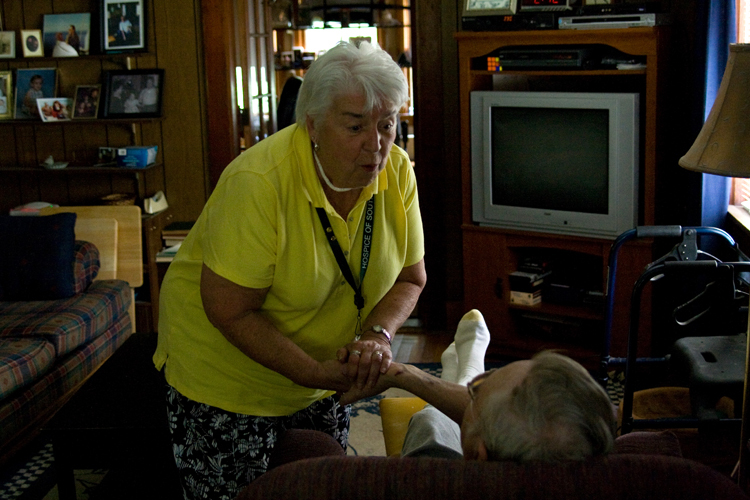 Fleurette finds the wide range of family dynamics that she encounters as a hospice volunteer truly fascinating. When her brother died from cancer in 1985, Fleurette saw firsthand what a difference a hospice volunteer could make for the whole family. 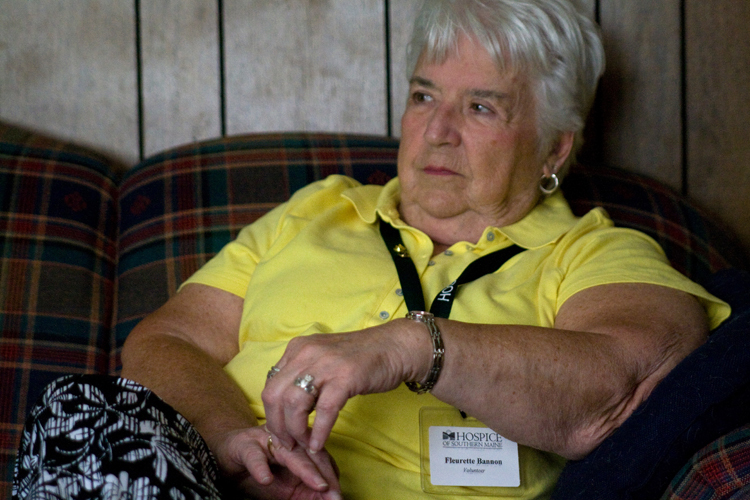 Although several years passed before she became a hospice volunteer, her family’s experience had stayed on her mind. 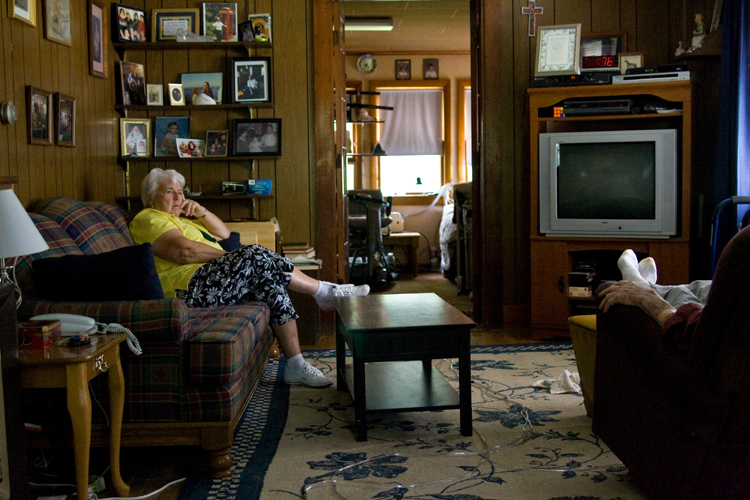 Normally, Fleurette’s time visiting with terminally ill individuals and family members can be measured in weeks or months; however, her longest assignment to date lasted for two years. 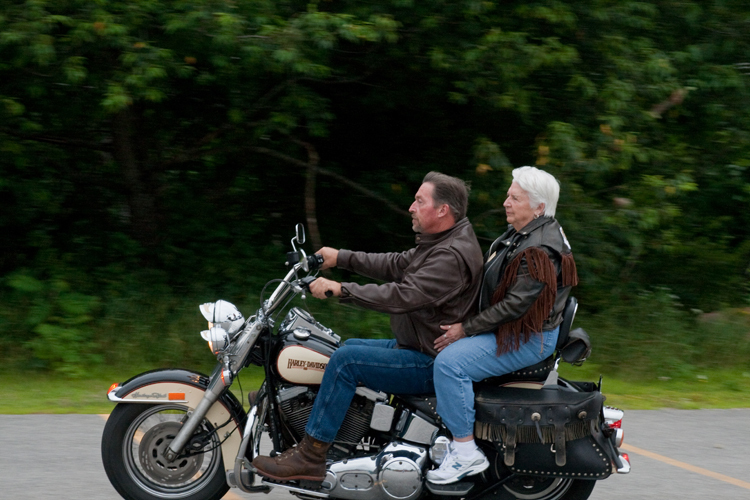 Fleurette enjoys riding on her oldest son Greg’s motorcycle every chance she gets. She took the plunge into the icy Atlantic in January three times, has been para-sailing twice, and hopes to take her first hot air balloon ride on her 80th birthday. 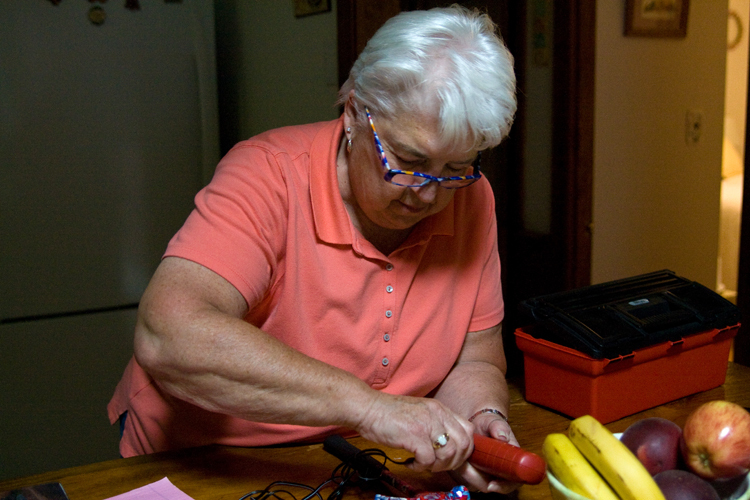 For Fleurette, spending time with family is an important part of her week. 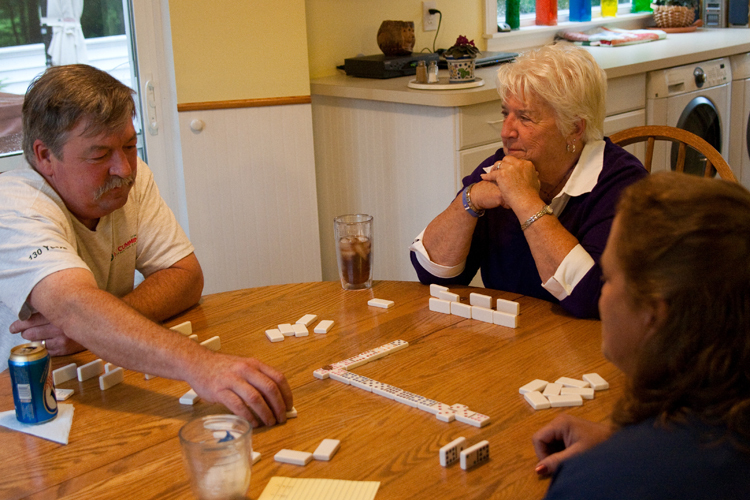 When the planned barbeque is rained out, a game of dominoes with her youngest son Sean and her daughter-in-law Anna is an acceptable alternative for a Saturday evening. 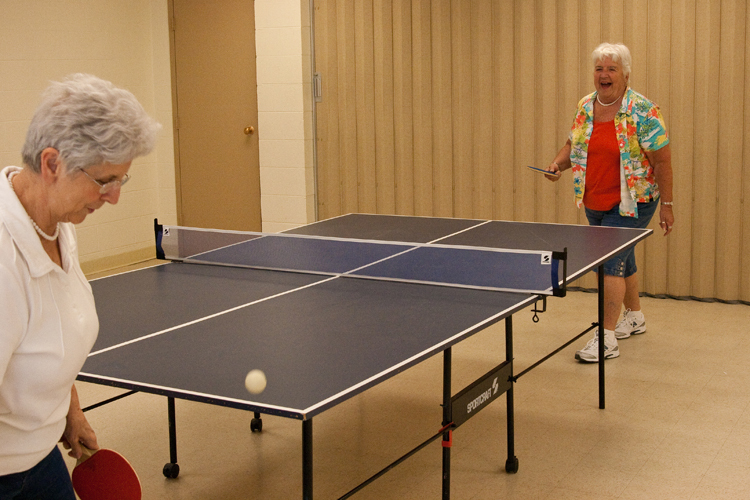 Fleurette and her close friend Shirley Ross play a spirited game of ping-pong at the Trafton Senior Center in Sanford, ME. 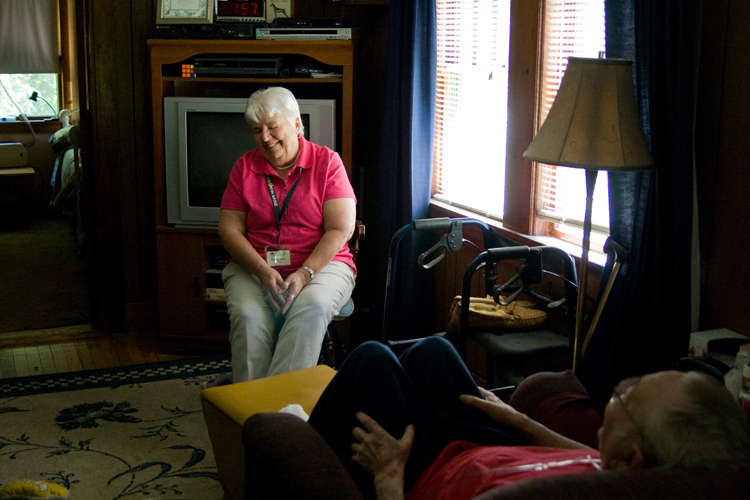 The two women have been friends for almost 50 years and went through volunteer training at Hospice of Southern Maine together in September 2000. Fleurette and fellow performers Pam Doyle (Hospice of Southern Maine staff member) and Anne Murray (Hospice of Southern Maine volunteer) prepare props for a performance of B.O.A.T.I.N.G., a one-act play that provides insight into benefits and burdens of medical treatment at the end of life. 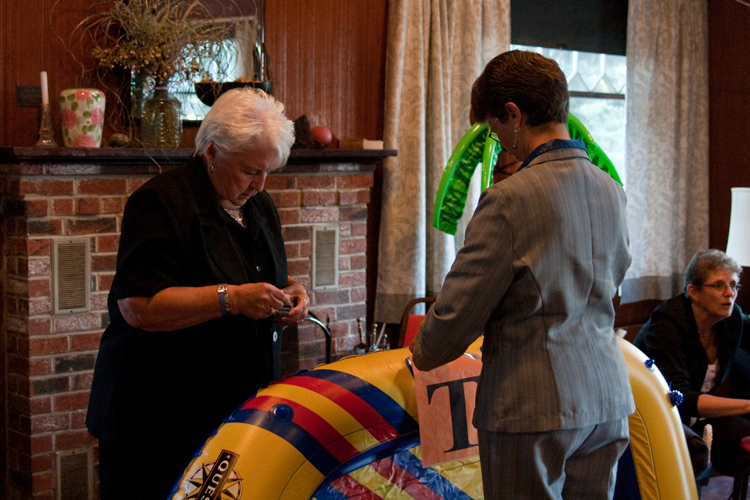 Hospice of Southern Maine staff and volunteers have been performing the B.O.A.T.I.N.G. 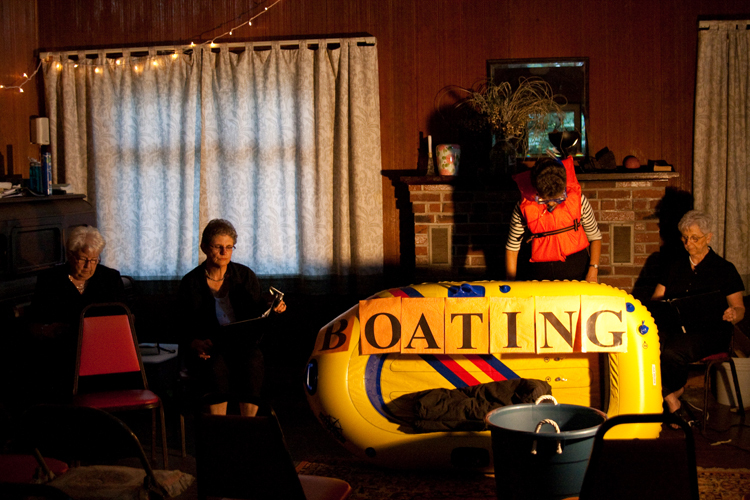 play, which is followed by group discussion, since 2004. Fleurette, Anne Murray (Hospice of Southern Maine volunteer), Pam Doyle (Hospice of Southern Maine staff member), and Shirley Ross (Hospice of Southern Maine volunteer) rehearse prior to a live performance. Originally designed as an educational tool for healthcare providers, the simple metaphor of the B.O.A.T.I.N.G. 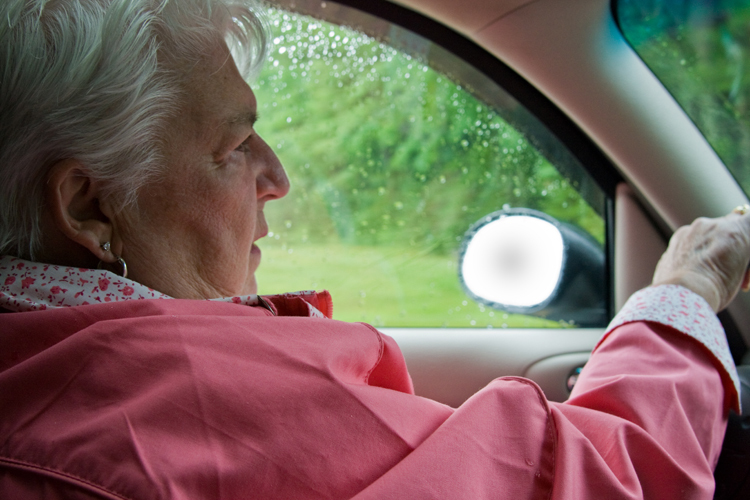 play communicates on a deeply personal level about end of life care decisions, something that has or will impact everyone. Frequently, audience members are moved to tears.